Age and especially weight loss can cause the underside of a person’s upper arms to get loose and “droopy.” Often, the skin itself can take on a flabby, uneven texture. While exercise can help tone arm muscles, it is unable to correct weakness in the tissue, eliminate specific fat deposits, or tighten skin that has lost its elasticity. An arm lift may be the answer. An arm lift can help patients feel more confident about their appearance, allowing them to wear short-sleeved clothing again without embarrassment or self-consciousness. An arm lift, also known as a brachioplasty, is a procedure to remodel the underside of a patient’s upper arm between the elbow and the armpit. Normally, excess skin and fat deposits are removed and the underlying tissue is tightened, leading to a much improved, toned look. An arm lift will leave a scar in the armpit or inside of the arm that may show if the arm is raised, but will otherwise be hidden. At The Plastic Surgery Clinic we perform approximately 100 arm lift procedures per year. This makes Dr. Lista, Dr. Ahmad and Dr. Austin well experienced in arm lift surgery. They are able to achieve natural results with the minimum amount of scarring. If you are considering this important surgery please explore the links on the left to learn more. If you have more questions about whether an arm lift in Toronto/Mississauga is for you, please contact us at info@theplasticsurgeryclinic.com to set up a complimentary consultation with Dr. Lista, Dr. Ahmad or Dr. Austin. Arm lift procedures are normally performed under general anaesthesia on an outpatient basis. During an arm lift, the surgeon makes an incision either on the inside or the back of the arm. The length of the incision depends on the amount of skin to be removed. The inner tissue is tightened and remodeled with sutures before the skin is trimmed and closed with sutures. Excess fat may also be removed through liposuction during the operation. An arm lift procedure takes about one to three hours, depending on the amount of work needed. Your arm lift can be performed right on site in the state-of-the-art facilities of The Plastic Surgery Clinic. The Clinic meets or exceeds national, provincial, and municipal health care facility standards in such important areas as equipment quality and infection control. If you prefer, you can choose to have your surgery at one of the hospitals where the highly skilled plastic surgeons at The Plastic Surgery Clinic enjoy privileges. These include the Mississauga site of the Trillium Health Centre and the University Health Network in Toronto. The best candidates for arm lift surgery have significant excess skin or loose tissue under their upper arms and are at a fairly stable weight, but not obese. Ideal candidates are also non-smokers without underlying health conditions that might make surgery more risky. Smokers should quit for at least two weeks before and after surgery, because smoking inhibits healing. An arm lift can have a positive effect on your self-esteem and will make you feel better about yourself. 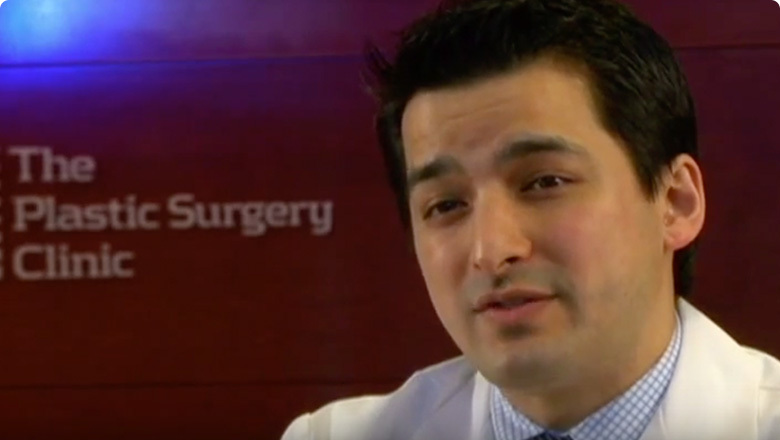 Patients often tell us how arm lift surgery has improved the quality of their lives. Before you decide to have surgery, think carefully about your expectations and discuss them with an experienced Toronto / Mississauga arm lift surgeon such as Dr. Lista, Dr. Ahmad or Dr. Austin. Dr. Lista, Dr. Ahmad and Dr. Austin are proud to have helped so many arm lift patients in Toronto and Mississauga learn to feel comfortable in short-sleeved clothing or bathing suits that reveal or even show off their arms. Your consultation will involve a physical examination, including a thorough medical history, and a discussion about your goals with surgery. You will be asked to describe your ideal look, as well as your expectations. Dr. Lista, Dr. Ahmad or Dr. Austin will examine you to determine exactly what procedure or combination of procedures will best help you meet your goals. For an arm lift, where the incision will be made and whether liposuction is needed will be carefully discussed. Your surgeon will work with you to recommend the procedure that will help you come closest to achieving your desired results. Your surgeon will also instruct you on how to prepare for surgery in order to achieve the best result, including guidelines on eating, drinking, and taking certain vitamins and medications. Smokers should plan to stop smoking for a minimum of two weeks before and after surgery, as smoking decreases circulation and interferes with proper healing. You may also be asked to refrain from taking aspirin, anti-inflammation drugs, or certain herbal supplements, as they may increase bleeding during the surgery. Arm lift surgery is performed at The Plastic Surgery Clinic as a day surgery procedure. A friend or relative will need to come and pick you up and stay with you at home for at least 24 hours. After the operation, in addition to any bandages placed over the incisions, the upper arms will be contained within an elastic (compression) bandage to reduce swelling. Patients are usually able to start showering and washing over their incisions the day after surgery. This procedure normally only requires a few days of downtime. It may take up to four weeks for the bruising and swelling to recede, however. Patients should refrain from any strenuous activity for four weeks. Scarring should fade by six months at the latest. Pain after surgery is not only uncomfortable, it also can slow down the healing process. That is why the surgeons at The Plastic Surgery Clinic take the time to anticipate their patients’ pain needs in advance, in order to help reduce the time it takes for you to get back on your feet. They have introduced the revolutionary Pain Relief Pump™ to ease the pain during the first 24 hours after surgery. This MP3 player-sized device is worn in a belt around the waist, with a hair-thin tube connecting it to the surgical site. Completely automatically, the device regularly delivers a long-acting local anesthetic into the wound. The result is that patients feel absolutely no pain. That means that patients do not usually need to take prescription pain medicines, which can be associated with significant side effects such as nausea, vomiting, and allergic reactions. Toronto cosmetic surgery patients at The Plastic Surgery Clinic experience no pain, heal faster, feel happier, have less swelling, and simply recover more quickly. The Pain Relief Pump™ has proven invaluable to plastic surgery patients and is almost exclusively available at The Plastic Surgery Clinic. Dr. Lista, Dr. Ahmad and Dr. Austin perform approximately 100 arm lift procedures each year. The results are ordinarily positive and complications are rare. Nevertheless, there are always risks associated with surgery, and there are specific complications associated with this procedure. Your surgeon will discuss these risks with you thoroughly during the consultation process. Post-operative complications such as infection and blood clots are rare. Infection can be treated with drainage and antibiotics, but may require a hospital stay. You can minimize the risk of blood clots by moving around as soon as possible after the surgery. At our state-of-the-art plastic surgery clinic in Toronto, patients are given anti-embolic stockings that they are asked to wear for one week following surgery. We also have a specialized device called a sequential compression pump that gently massages the patient’s legs during surgery and, combined with the stockings, greatly decreases the risk of blood clots in the legs. Most arm lift patients at the Plastic Surgery Clinic are very happy with the results. Arm lift surgery creates upper arms that are toned, youthful, and natural-looking. Sleeveless clothing can be worn with confidence. These results are normally long-lasting. Unless the arms are raised, the scars are not normally visible, and they should fade with time. During your complimentary consultation with one of our plastic surgeons, you’ll be able to see a variety of photos that show the results of arm lift patients at The Plastic Surgery Clinic. Please visit our arm lift photo gallery to see all of our arm lift photos available online. At the Plastic Surgery Clinic, we thrive on helping our patients achieve their goals. We’ve seen it many times: you’ve done the research, you know what you want done, you’re ready for the transformation, but the cost is daunting. That is why we offer complimentary consultations. One of our expert plastic surgeons will speak to you one-on-one to learn about your goals, go over the finer points of the surgery, and to give you an accurate cost. At this time one of our patient coordinators will also speak to you about the various financing options that make surgery more affordable than you ever thought it could be. To find out more about the cost of body contouring after weight loss, please contact us by phone or e-mail or by filling out the Request for Information form below.